Lost in the commotion of the beginning of the week was the sad news that one of my favorite comedic actors, Lesxlie Nielsen, had passed away at the age of 84 due to complications from pneumonia. 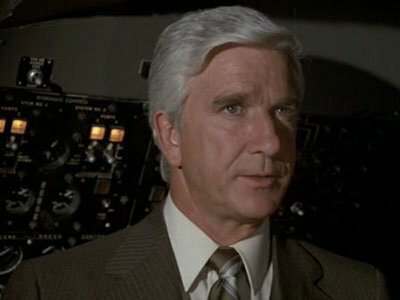 My first introduction to Nielsen was in the classic spoof film, Airplane!. What made the film even funnier at the time — and an element that I didn’t get on the first viewing as a kid — was the hilarious playing-against-type performances by Nielsen and other actors known for their serious roles, such as Robert Stack, Peter Graves, and Lloyd Bridges. Nielsen re-invented his career with his brilliant performance as Dr. Rumack, and he would take his straight man role to even greater heights as the bumbling Lt. Frank Drebin in the trilogy of Naked Gun movies. A heartfelt thanks to Nielsen for all of the laughs he provided us. And for your enjoyment, some clips — including the rarely-seen Police Squad! television series, on which The Naked Gun films were based. Who is The Last Honest Man?